This page gives some details on the dotat.at DNSSEC outage on November 12, 2017. 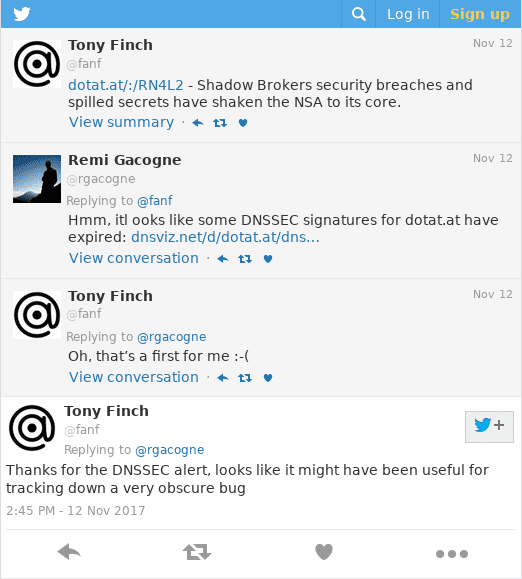 It is notable for being the domain of Tony Finch, who is one of the most capable DNSSEC people there is. zonemaster.net archived "RRSIG with keytag 5677 and covering type(s) DNSKEY expires at : Tue Nov 14 10:32:06 2017." zonemaster.fr archived "RRSIG with keytag 5677 and covering type(s) DNSKEY expires at : Tue Nov 14 10:32:06 2017."